Enjoy a lazy day beside the pool with a good book surrounded by the beautiful and peaceful Mediterranean garden with it’s backdrop of mountains … planted with hibiscus, perfumed jazmin, giant cacti and terracotta pots bursting with vibrantly coloured geraniums …… and only the sound of cicadas in the heat of the day! 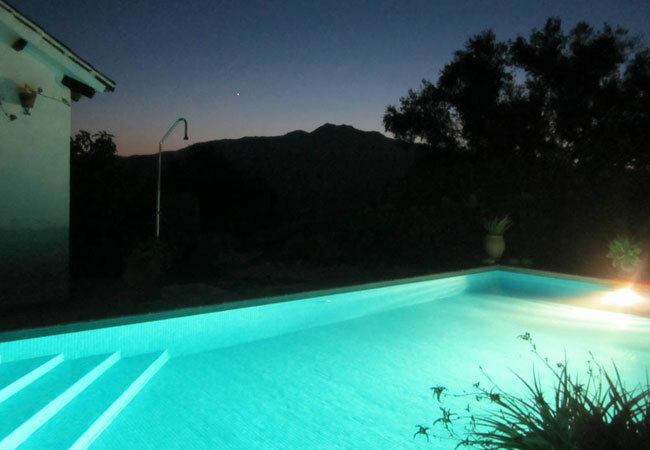 Filtered swimming pool 8m x 4m …. Outdoor dining table for four. 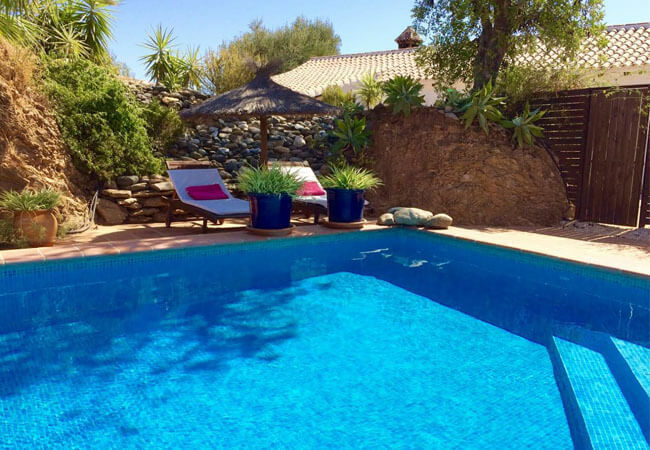 As well as having a separate sun bed area by the pool garden there is a private sun bed and parasol patio outside each cottage. Most nights we dined outside on the patio as the sun went slowly down with the distant sound of goat bells in the distance. 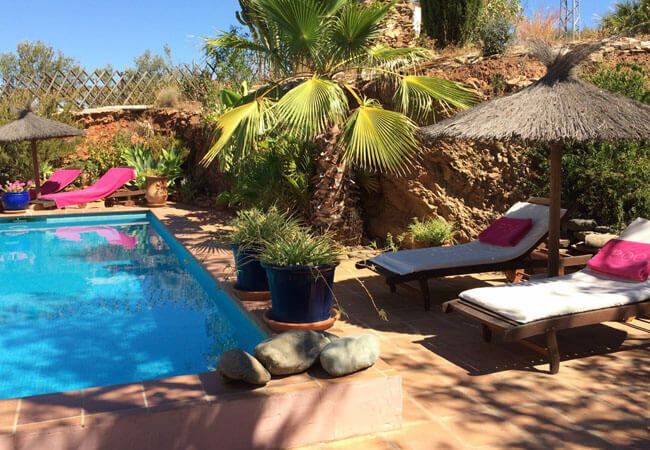 Our 3rd stay in Los Olivos this time with friends in Casa Limones a fabulous time has been had by all, waking up to the panoramic view is so good for the soul! That view!! …… Thanks for the hospitality and loved waking up to the mountain view and gentle Bobby the Boxer resting in our porch to say good morning!! 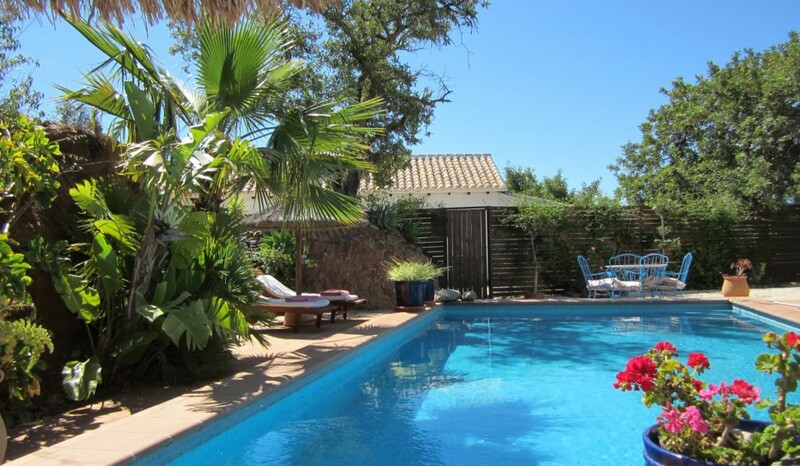 Lovely break in Los Olivos peaceful surroundings, great pool and fabulous sunset views! Thank you! 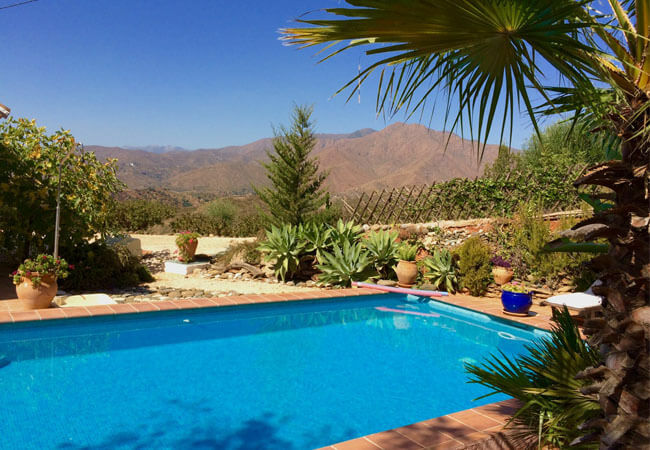 Fabulous and restful short stay at Casa Limones, perfect accommodation and location – great hiking, wish we could stay longer! 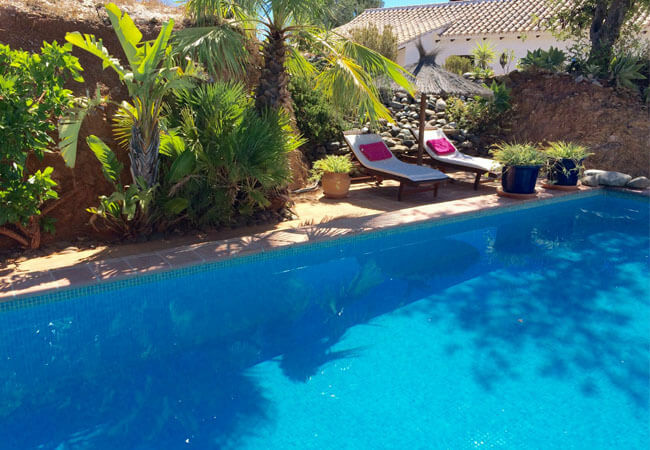 Casa Limones is the perfect bolt-hole with gorgeous views, easy access for sightseeing and beaches …. cant wait the return in 2019! 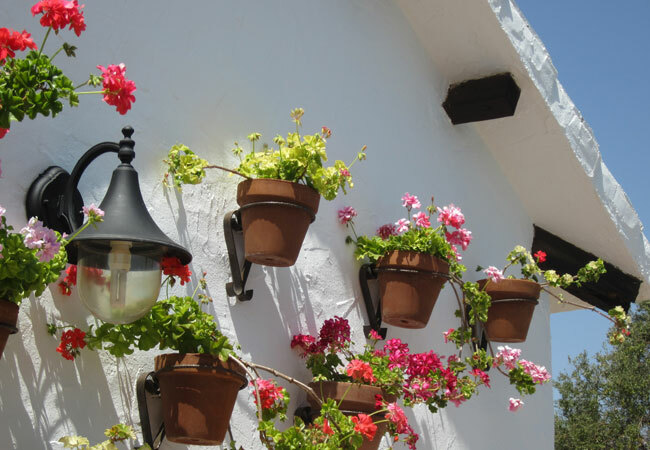 A wonderful stay – fantastic walking in the hills around Mijas, thank you for a warm welcome and cosy cottage! Thank you for a wonderful holiday, a lovely cottage to stay in, the views are beautiful and everything is kept so well. Nothing as special as sitting outside Los Olivos and watching the birds and drinking in the view with Bobby the Boxer for company! Such a well behaved dog. Thank you for all the thoughtful info and welcome pack and herbs, much appreciated, wish we had longer! 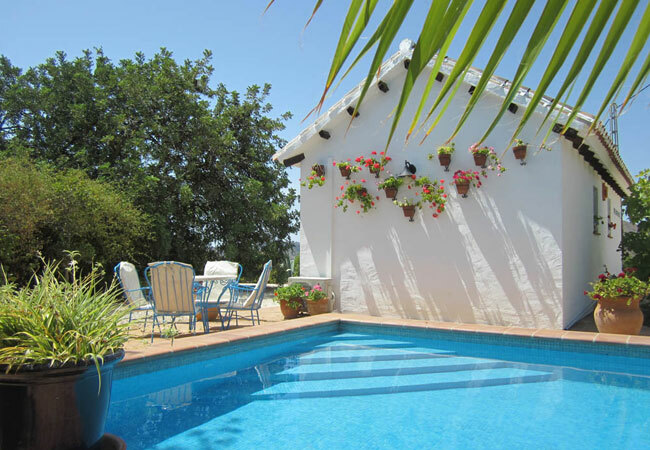 We came for a much needed break and have been totally revitalised by this wonderful peaceful haven, a Special Place in Spain! Los Olivos continues to lure us back with the beautiful tranquil views! Colin and Sheila. Chester. August 2018.
in the mountains we have loved it! ©2019 Casa Limones - All Rights Reserved.